The 33-year-old Spaniard lost in the opening round to Mario Vilella Martínez. Teenager Carlos Alcaraz Garfia advances. 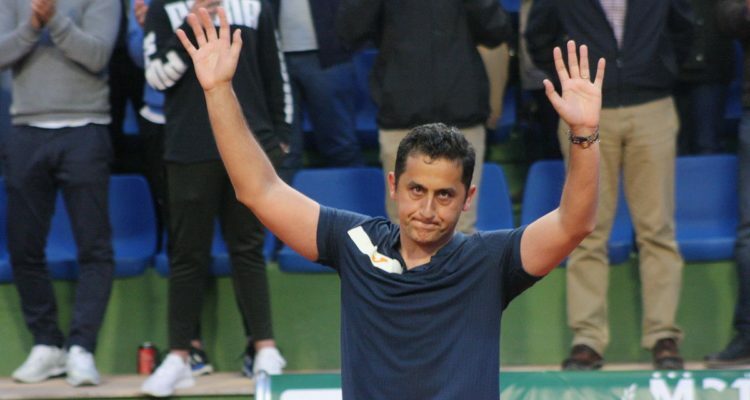 Nicolas Almagro‘s professional tennis career has come to an end. The 33-year-old Spaniard lost to compatriot Mario Vilella Martínez in the opening round of the €46,600 Murcia Open on Tuesday evening. In front of packed stands, including his friends and family at the Club de Tenis Murcia 1919, Almagro played his first competitive match since retiring in the first round of the Szczecin Open in September last year. The former World No. 9, who clinched 13 ATP Tour career titles, suffered from a knee injury in recent years. Earlier in the week in Murcia, Almagro announced to hang up his racket after his home tournament. The local favourite lost 6-2, 6-2 in exactly one hour of play. Almagro, however, will return to doubles action on Wednesday evening, teaming up with Juan Antonio Marin of Croatia. The pair will take on No. 3 seeds Ariel Behar of Uruguay and Andrea Vavassori from Italy. Vilella Martínez will next take on No. 11 seeded Argentine Facundo Arguello. Earlier on Pista Central, another Murcia native delighted his home crowd. 15-year-old Carlos Alcaraz Garfia, protegé of former World No. 1 Juan Carlos Ferrero, secured his second ATP Challenger main draw match win against Frenchman Gleb Sakharov. The teenager broke his opponent’s serve four times to seal a 7-6(6), 6-4 victory in two hours of play. Up next for Alcaraz Garfia will be No. 5 seed Pedro Martínez Portero of Spain, who finished runner-up at last week’s Ferrero Challenger Open in Alicante. Top seed Pedro Sousa from Portugal opened his title bid with a comfortable 6-2, 6-3 win over Spanish wild card entry Gerard Granollers. The World No. 105 won 60 per cent of the total points played to finish the encounter after one hour and 11 minutes. Sousa will next face Tallon Griekspoor from the Netherlands, the tournament’s No. 15. This entry was posted in ATP Challenger Murcia, ATP Challenger Tour and tagged ATP Challenger Tour, Murcia Open, Nicolas Almagro.